Salicylic acid (from Latin salix, willow tree) is a lipophilic monohydroxybenzoic acid, a type of phenolic acid, and a beta hydroxy acid (BHA). It has the formula C7H6O3. This colorless crystalline organic acid is widely used in organic synthesis and functions as a plant hormone. It is derived from the metabolism of salicin. In addition to serving as an important active metabolite of aspirin (acetylsalicylic acid), which acts in part as a prodrug to salicylic acid, it is probably best known for its use as a key ingredient in topical anti-acne products. The salts and esters of salicylic acid are known as salicylates. Salicylic acid as a medication is used most commonly to help remove the outer layer of the skin. As such, it is used to treat warts, psoriasis, acne, ringworm, dandruff, and ichthyosis. Similar to other hydroxy acids, salicylic acid is a key ingredient in many skincare products for the treatment of seborrhoeic dermatitis, acne, psoriasis, calluses, corns, keratosis pilaris, acanthosis nigricans, ichthyosis and warts. Salicylic acid is used in the production of other pharmaceuticals, including 4-aminosalicylic acid, sandulpiride, and landetimide (via Salethamide). Salicylic acid was one of the original starting materials for making acetylsalicylic acid (aspirin) in 1897. Bismuth subsalicylate, a salt of bismuth and salicylic acid, is the active ingredient in stomach relief aids such as Pepto-Bismol, is the main ingredient of Kaopectate and "displays anti-inflammatory action (due to salicylic acid) and also acts as an antacid and mild antibiotic". Other derivatives include methyl salicylate used as a liniment to soothe joint and muscle pain and choline salicylate used topically to relieve the pain of mouth ulcers. Salicylic acid is used as a food preservative, a bactericidal and an antiseptic. Sodium salicylate is a useful phosphor in the vacuum ultraviolet spectral range, with nearly flat quantum efficiency for wavelengths between 10 and 100 nm. It fluoresces in the blue at 420 nm. It is easily prepared on a clean surface by spraying a saturated solution of the salt in methanol followed by evaporation. Aspirin (acetylsalicylic acid or ASA) can be prepared by the esterification of the phenolic hydroxyl group of salicylic acid with the acetyl group from acetic anhydride or acetyl chloride. Salicylic acid directly and irreversibly inhibits the activity of both types of cyclo-oxygenases (COX-1 and COX-2) to decrease the formation of precursors of prostaglandins and thromboxanes from arachidonic acid. Salicylate may competitively inhibit prostaglandin formation. Salicylate's antirheumatic (nonsteroidal anti-inflammatory) actions are a result of its analgesic and anti-inflammatory mechanisms. Salicylic acid works by causing the cells of the epidermis to slough off more readily, preventing pores from clogging up, and allowing room for new cell growth. Salicylic acid inhibits the oxidation of uridine-5-diphosphoglucose (UDPG) competitively with nicotinamide adenosine dinucleotide (NAD) and noncompetitively with UDPG. It also competitively inhibits the transferring of glucuronyl group of uridine-5-phosphoglucuronic acid (UDPGA) to the phenolic acceptor. The wound-healing retardation action of salicylates is probably due mainly to its inhibitory action on mucopolysaccharide synthesis. As a topical agent and as a beta-hydroxy acid (and unlike alpha-hydroxy acids), salicylic acid is capable of penetrating and breaking down fats and lipids, causing moderate chemical burns of the skin at very high concentrations. It may damage the lining of pores if the solvent is alcohol, acetone or an oil. Over-the-counter limits are set at 2% for topical preparations expected to be left on the face and 3% for those expected to be washed off, such as acne cleansers or shampoo; up to a 6% concentration can be used if necessary under prescription for these uses. 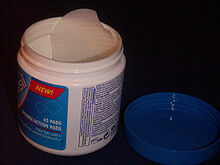 17% to 27% salicylic acid used in the form of a paint, and 20% to 50% in plaster form, which are sold for wart and corn removal should not be applied to the face and should not be used for acne treatment. Even for wart removal, such a solution should be applied once or twice a day – more frequent use may lead to an increase in side-effects without an increase in efficacy. Some people are hypersensitive to salicylic acid and related compounds. If high concentrations of salicylic ointment are applied to a large percentage of body surface, high levels of salicylic acid can enter the blood, requiring hemodialysis to avoid further complications. Salicylic acid has the formula C6H4(OH)COOH, where the OH group is ortho to the carboxyl group. It is also known as 2-hydroxybenzoic acid. It is poorly soluble in water (2 g/L at 20 °C). Salicylic acid is biosynthesized from the amino acid phenylalanine. In Arabidopsis thaliana it can be synthesized via a phenylalanine-independent pathway. It can also be prepared by the hydrolysis of aspirin (acetylsalicylic acid) or methyl salicylate (oil of wintergreen) with a strong acid or base. 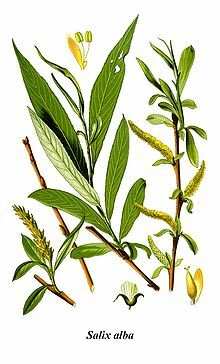 Hippocrates, Galen, Pliny the Elder and others knew that willow bark could ease pain and reduce fevers. It was used in Europe and China to treat these conditions. This remedy is mentioned in texts from ancient Egypt, Sumer and Assyria. The Cherokee and other Native Americans used an infusion of the bark for fever and other medicinal purposes. In 2014, archaeologists identified traces of salicylic acid on 7th century pottery fragments found in east central Colorado. The Reverend Edward Stone, a vicar from Chipping Norton, Oxfordshire, England, noted in 1763 that the bark of the willow was effective in reducing a fever. The active extract of the bark, called salicin, after the Latin name for the white willow (Salix alba), was isolated and named by the German chemist Johann Andreas Buchner in 1828. A larger amount of the substance was isolated in 1829 by Henri Leroux, a French pharmacist. 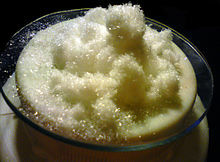 Raffaele Piria, an Italian chemist, was able to convert the substance into a sugar and a second component, which on oxidation becomes salicylic acid. Salicylic acid occurs in plants as free salicylic acid and its carboxylated esters and phenolic glycosides. Several studies suggest that humans metabolize salicylic acid in measurable quantities from these plants; one study found that vegetarians not taking aspirin had urinary levels of salicylic acid higher than the non-vegetarians. Dietary sources of salicylic acid and their interaction with drugs such as aspirin have not been well studied. Ongoing clinical studies of people with aspirin-induced asthma have shown some benefits of a diet low in salicylic acid. Studies on the salicylic content of foods are sparse and have produced distinctly different results, giving rise to controversy. Possible causes for the discrepancies include uncontrolled and often unreported factors such as cultivation area, crop species, and harvest methods, as well as inherent issues with the studies such as poor extraction and measurement procedures and limited or low-accuracy equipment. A recent study using best practice measurement methodology significantly reduced intra-sample measurement variability but has not yet been replicated or extended. Some results have been consistently reported. Meat, poultry, fish, eggs, oils, dairy products, sugar, cereals, and flour all have little to no salicylates. Measurable levels of salicylic acid have been found in fruits, vegetables, herbs, spices, nuts, and teas. Salicylic acid is a phenolic phytohormone and is found in plants with roles in plant growth and development, photosynthesis, transpiration, ion uptake and transport. SA is involved in endogenous signaling, mediating in plant defense against pathogens. It plays a role in the resistance to pathogens by inducing the production of pathogenesis-related proteins. It is involved in the systemic acquired resistance in which a pathogenic attack on one part of the plant induces resistance in other parts. The signal can also move to nearby plants by salicylic acid being converted to the volatile ester methyl salicylate. ^ "Front Matter". Nomenclature of Organic Chemistry : IUPAC Recommendations and Preferred Names 2013 (Blue Book). Cambridge: The Royal Society of Chemistry. 2014. p. 64. doi:10.1039/9781849733069-FP001. ISBN 978-0-85404-182-4. ^ a b c Haynes, William M., ed. (2011). CRC Handbook of Chemistry and Physics (92nd ed.). Boca Raton, FL: CRC Press. p. 3.306. ISBN 1439855110. ^ a b c d e f g h "Salicylic acid". ^ a b c Atherton Seidell; William F. Linke (1952). Solubilities of Inorganic and Organic Compounds: A Compilation of Solubility Data from the Periodical Literature. Supplement. Van Nostrand. ^ a b c Sigma-Aldrich Co., Salicylic acid. Retrieved on 2014-05-23. ^ a b "Salicylic acid". Drugs.com. Retrieved 15 January 2017. ^ WHO Model Formulary 2008 (PDF). World Health Organization. 2009. p. 310. ISBN 9789241547659. Retrieved 8 January 2017. ^ Madan RK; Levitt J (April 2014). "A review of toxicity from topical salicylic acid preparations". J Am Acad Dermatol. 70 (4): 788–92. doi:10.1016/j.jaad.2013.12.005. PMID 24472429. ^ Schrör, Karsten (2016). Acetylsalicylic Acid (2 ed.). John Wiley & Sons. pp. 9–10. ISBN 9783527685028. ^ "Bismuth subsalicylate". PubChem. United States National Institutes of Health. Retrieved 24 January 2014. ^ "Definition of Salicylic acid". MedicineNet.com. ^ Samson, James (1976). Techniques of Vacuum Ultraviolet Spectroscopy. Wiley, . ^ a b "SALICYLIC ACID - National Library of Medicine HSDB Database". toxnet.nlm.nih.gov. Retrieved 2018-08-21. ^ salicylic acid 17 % Topical Liquid. Kaiser Permanente Drug Encyclopedia. Accessed 28 Sept 2011. ^ Péc, J.; Strmenová, M.; Palencárová, E.; Pullmann, R.; Funiaková, S.; Visnovský, P.; Buchanec, J.; Lazarová, Z. (October 1992). "Salicylate intoxication after use of topical salicylic acid ointment by a patient with psoriasis". Cutis. 50 (4): 307–309. ISSN 0011-4162. PMID 1424799. ^ "Salicylic acid". inchem.org. Retrieved 2008-10-13. ^ "Hydrolysis of ASA to SA". Retrieved July 31, 2007. ^ Norn, S.; Permin, H.; Kruse, P. R.; Kruse, E. (2009). "[From willow bark to acetylsalicylic acid]". Dansk Medicinhistorisk Årbog (in Danish). 37: 79–98. PMID 20509453. ^ "Willow bark". University of Maryland Medical Center. University of Maryland. Retrieved 19 December 2011. ^ Goldberg, Daniel R. (Summer 2009). "Aspirin: Turn of the Century Miracle Drug". Chemical Heritage Magazine. 27 (2): 26–30. Retrieved 24 March 2018. ^ Hemel, Paul B. and Chiltoskey, Mary U. Cherokee Plants and Their Uses – A 400 Year History, Sylva, NC: Herald Publishing Co. (1975); cited in Dan Moerman, A Database of Foods, Drugs, Dyes and Fibers of Native American Peoples, Derived from Plants. A search of this database for "salix AND medicine" finds 63 entries. ^ "1,300-Year-Old Pottery Found in Colorado Contains Ancient 'Natural Aspirin'". ^ Stone, Edmund (1763). "An Account of the Success of the Bark of the Willow in the Cure of Agues". Philosophical Transactions of the Royal Society of London. 53: 195–200. doi:10.1098/rstl.1763.0033. Leroux, H. (1830). "Mémoire relatif à l'analyse de l'écorce de saule et à la découverte d'un principe immédiat propre à remplacer le sulfate de quinine"] (Memoir concerning the analysis of willow bark and the discovery of a substance immediately likely to replace quinine sulfate)". Journal de Chimie Médicale, de Pharmacie et de Toxicologie. 6: 340–342. A report on Leroux's presentation to the French Academy of Sciences also appeared in: Mémoires de l'Académie des sciences de l'Institut de France. Institut de France. 1838. pp. 20–. ^ Piria (1838) "Sur de neuveaux produits extraits de la salicine" (On new products extracted from salicine), Comptes rendus … 6: 620–624. On page 622, Piria mentions "Hydrure de salicyle" (hydrogen salicylate, i.e., salicylic acid). ^ Jeffreys, Diarmuid (2005). Aspirin: the remarkable story of a wonder drug. New York: Bloomsbury. pp. 38–40. ISBN 978-1-58234-600-7. ^ Löwig, C.; Weidmann, S. (1839). "III. Untersuchungen mit dem destillierten Wasser der Blüthen von Spiraea Ulmaria (III. Investigations of the water distilled from the blossoms of Spiraea ulmaria). Löwig and Weidman called salicylic acid Spiräasaure (spiraea acid)". Annalen der Physik und Chemie; Beiträge zur Organischen Chemie (Contributions to Organic Chemistry) (46): 57–83. ^ a b c d Malakar, Sreepurna; Gibson, Peter R.; Barrett, Jacqueline S.; Muir, Jane G. (1 April 2017). "Naturally occurring dietary salicylates: A closer look at common Australian foods". Journal of Food Composition and Analysis. 57: 31–39. doi:10.1016/j.jfca.2016.12.008. ^ Lawrence, J R; Peter, R; Baxter, G J; Robson, J; Graham, A B; Paterson, J R (28 May 2017). "Urinary excretion of salicyluric and salicylic acids by non-vegetarians, vegetarians, and patients taking low dose aspirin". Journal of Clinical Pathology. 56 (9): 651–653. doi:10.1136/jcp.56.9.651. ISSN 0021-9746. PMC 1770047. PMID 12944546. ^ Race, Sharla (2012). "Salicylate in Food". The Salicylate Handbook: Your Guide to Understanding Salicylate Sensitivity. Sharla Race. ISBN 9781907119040. ^ "Food Guide". Salicylate Sensitivity. ^ Sommer, Doron D.; Rotenberg, Brian W.; Sowerby, Leigh J.; Lee, John M.; Janjua, Arif; Witterick, Ian J.; Monteiro, Eric; Gupta, Michael K.; Au, Michael; Nayan, Smriti (April 2016). "A novel treatment adjunct for aspirin exacerbated respiratory disease: the low-salicylate diet: a multicenter randomized control crossover trial". International Forum of Allergy & Rhinology. 6 (4): 385–391. doi:10.1002/alr.21678. PMID 26751262. ^ "Salicylates in foods" (PDF). Retrieved 2014-05-09. ^ Vlot, A. C; Dempsey, D. A; Klessig, D. F (2009). "Salicylic Acid, a multifaceted hormone to combat disease". Annual Review of Phytopathology. 47: 177–206. doi:10.1146/annurev.phyto.050908.135202. PMID 19400653. ^ Hayat, S. & Ahmad, A. (2007). Salicylic Acid – A Plant Hormone. Springer. ISBN 978-1-4020-5183-8. ^ Van Huijsduijnen, R. A. M. H.; Alblas, S. W.; De Rijk, R. H.; Bol, J. F. (1986). "Induction by Salicylic Acid of Pathogenesis-related Proteins or Resistance to Alfalfa Mosaic Virus Infection in Various Plant Species". Journal of General Virology. 67 (10): 2135–2143. doi:10.1099/0022-1317-67-10-2135. ^ Taiz, L. and Zeiger, Eduardo (2002) Plant Physiology, 3rd Edition, Sinauer Associates, p. 306, ISBN 0878938230. Wikimedia Commons has media related to Salicylic acid. English Translation of Hermann Kolbe's seminal 1860 German article in Annalen der Chemie und Pharmacie. English title: 'On the syntheses of salicylic acid'; German title "Ueber Synthese der Salicylsäure".